Here is the dataset used, directly downloaded from FRED. Non-farm payroll employment should be slowing the closer we get to full employment. Like Trump denies knowing Wikileaks, TrumpConfused tries to pretend we were never close to full employment. Next stupid comment please?! Your neighborhood’s psychiatrist will be pissed you’re self-healing and he lost that office visit fee, but hey, that’s how it goes in the big city kids. If my memory serves me well a change in employment growth would involve a structural break would it not? You FINALLY provided us with an intelligent and honest link. Try reading it Peaky as it shows that the Obama record was quite good. Just the opposite of that stupid right wing meme you have peddled here. 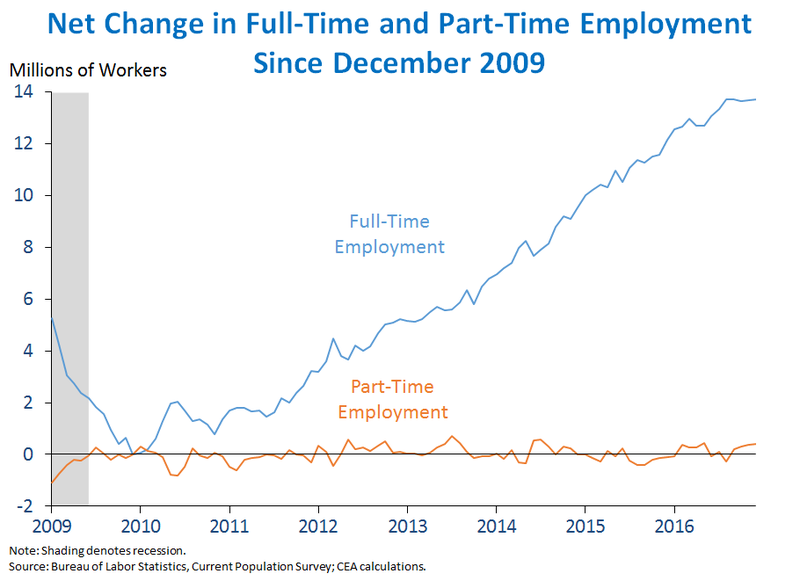 Peak, this https://obamawhitehouse.archives.gov/sites/whitehouse.gov/files/images/Charts/chart7_JOBS_netchangeemployment.png is what the past administration was projecting at its end. Notice the flattening during 2016? Also notice this comment: “Source: BLS March 2019 employment situation release, and author’s calculations.” Menzie, why did you pick that start date? I personally would like to see the difference starting in 2008, just to show a more complete trend for the Obama administration, and to forestall any thoughts of cherry picking the data. BTW, what was the constant you used? Corev: Using a stochastic trend in this case is equivalent to estimating a random walk with drift. The constant is therefore the constant in a regression where the LHS variable is the first log difference of employment. Start date is trough of employment. Menzie, “Start date is trough of employment.” exactly, why I questioned your approach. I’ll repeat my concerns: “Menzie, why did you pick that start date? I personally would like to see the difference starting in 2008, just to show a more complete trend for the Obama administration, and to forestall any thoughts of cherry picking the data.” I am more familiar with temperature time series data where anomalies are used to measure changes. Coupled with the selection of start date leaves questions whether the trend substantially changes with other start date selections. I often point out the importance of start and stop dates when commenting on trends. Yours is especially egregious, regardless of the math used. Is your approach the best/better approach for a time series of real observations? Your definition of the constant comes across as just another obfuscation. Is it static or moving. CoRev: Can you provide the raw data used? Come on CoRev – you do know how to use the internet. http://www.bls.gov????? Accusing our host of manipulating things is really disgusting but not knowing how to look up data when our host noted his source is stupid even for you. And somehow I bet CoRev cannot even figure it out using FRED! Of late I have concluded our trolls are the most inept ever. Trump needs to hire better ones! An old man’s failing memory, but Obama’s first term started on 20 Jan 2009. Bush 43 was President in 2008. Do you know what a random walk with drift process is? The constant is the drift parameter. That’s what provides the “trend” in a “stochastic trend” model. The “stochastic” part is because it’s a random walk. Don’t confuse these with deterministic trend models. CoRev: My experience is that drift term estimate is not sensitive to endpoint changes. You should try it yourself. The fact that you think my definition of a constant is obfuscation indicates you have no understanding of conventional time series analysis. Suggest you read Hamilton’s “Time Series Analysis”. CoRev Note Menzie’s comment about why drift terms in a stochastic trend model are not terribly sensitive to end or start points. The intuition as to why this is true is obvious. If you regress the LHS by a constant, this is exactly equivalent to finding the arithmetic mean. When the LHS is in first differences it’s almost always the case that the relative magnitudes will be roughly similar, and if you have many observations, the effect of any one outlier first difference is dampened. The constant (or drift term) represents the average change associated with each random step in a random walk. As each average change is accumulated (or “integrated”) across time the result is a trend. 2slugs says: “If you really don’t understand why some start/stop dates are better than others, then you might want to acquaint yourself with some of the structural change tests.” Selecting start/stop dates is better to supporting an agenda. While deliberately ignoring data also supports the same agenda. Menzie, My experience is that trend analysis on a limited time series will almost always result in the subset remaining within trend. BTW, I noticed you carried the trend into estimation territory. Where is that oft-referenced recession? Pgl</b, since finding the raw data from Menzie's reference is so, so simple, SHOW IT TO US! Don't embarrass yourself again by failing to provide it. My experience is that trend analysis on a limited time series will almost always result in the subset remaining within trend. BTW, I noticed you carried the trend into estimation territory. Where is that oft-referenced recession? The third sentence, a question, makes no sense at all. The last recession in the United States, according to NBER BCDC is 2007M12-09M06. I’m pretty sure pgl can find the data series PAYEMS on FRED. CoRev Selecting start/stop dates is better to supporting an agenda. While deliberately ignoring data also supports the same agenda. Huh? I cannot figure out what you’re trying to say. My comment and link referred you to a standard way of determining when there is a structural break in a time series. It’s basic stuff. It’s not a matter of cherry picking dates; it’s just a matter of applying some well accepted time series diagnostics. If you want to contribute to discussions in a meaningful way, then it means you have an obligation to at least go to the effort of learning some basic economics and time series econometrics. Otherwise you’re just the slow kid in the class that frustrates everyone else. I see some noise but a general strong upward trend. Leave it to our favorite Trump troll to focus on the noise! Hey – NYC is a bit cooler than it was over the weekend. By the CoRev standard – global warming is no longer an issue! Pgl says: “Hey – NYC is a bit cooler than it was over the weekend. ” Is a bit cooler in in nominal, real or anomalous terms? If you understood the differences, and answer would be EZ. Except we can expect another runner from our in house troll. Your questions get dumber and dumber. Do you really think we measure temperature in terms of dollars? Keep it up CoRev – your stupidity amuses everyone. Which is why your own dog cannot stop laughing! Pgl, you;’ve lost the bubble again. We’re talking about temperature not dollars. “Do you really think we measure temperature in terms of dollars?” Just a reminder I didn’t make the comparison temperature, That was your leap into ignorant fantasy. BTW,can you describe what anomaly temperatures measurements are, or what would the expected average temperature be for this weekend? If the comment is only 3 days old, am I still allowed to gloat?? And all of this, without ever falsely claiming I’m a policy expert, “consultant”, or leaving 60 links to my blog inside of a week. Did Germany extend that “deadline” or did Britain extend that “deadline” for Brexit?? Some commenters here are actually going to have to think hard to answer that one. But they might be thinking for once, so take life’s miracles where you can get them. I might also add while I’m on the subject, which of the two parties (EU or Britain) would have blinked first if Britain didn’t have their own currency?? Some of you, I think the same two commenters that like to lecture me I supposedly don’t know the difference between EU and the EZ have a hard time “processing” the fact this makes/made a big difference in Britain’s former “deadline” of late March. Maybe at least ONE of the two of you who made that accusation are starting to “get it” now. One of you maybe……..
Moses Herzog I’m not sure what you mean by “blinked first”, but the 31 Oct 2019 extension is hardly a victory for the Brexit supporters. The central issue is the Northern Ireland border, and that will still be the problem six months from now. Britain having its own currency is irrelevant to the Northern Ireland question. The EU will not accept any hard border between Northern Ireland and the Republic; but Brexit supporters insist on a hard border, otherwise it’s Brexit In Name Only (BINO). The Labor party insists on remaining in a customs union, but the Brexit Tories want to be able to negotiate their own trade agreements outside of a customs union. The consensus view is that the delay means Britain has to participate in the upcoming EU elections and do so with the so called “BoJo childproof safety cap” in place so that Boris Johnson cannot cause mischief. It also makes it very likely that there will be a second referendum, which is why the pro-Brexit crowd was apoplectic over May getting the extension. The Brexit crowd knows that this extension is probably the death knell for Brexit. It’s also the death knell for May’s political career. I think you are the only person following this, who wouldn’t understand what “blinked first” means. Who do you think gave the extension, and who do you think decided the Halloween timing of the extension?? If you’re too arrogant to figure it out, those are rhetorical questions with an obvious answer. Your base argument Is that EU (often read Germany) decided to give Britain a 7 months long extension (when Theresa May had only asked for 3 more months) because the EU is afraid of losing trade with Ireland?? You’re the very first person I’ve heard present that opinion. I haven’t heard anyone, including “the Brexit crowd”, say that the extension to Halloween is “the death knell” for Brexit. 2slugbaits, you also apparently “got the exclusive” on that. Interested in seeing where you read that 2slugbaits? ?—-or was it just a personal psychic vision you had?? Let me clue in 2slugbaits on one other thing: Theresa May’s days as PM were numbered ever since the vote on the referendum. Whoever would have been UK PM (male/female/wildebeest/outback kangaroo/orangeexcrement etc) would have been made out as “the baddy” in this situation. Anyone with even a shallow perception of political events, knew May’s days were numbered from the time referendum vote results became public. Yes, British Parliament had a nice scapegoat near at hand, in a woman who was enforcing/enacting a democratic vote that was near split down the middle of the country. The same as the EU tried to crucify Yanis Varoufakis for not rolling over and playing dead and for making fallback plans for Greece based bank depositors, which the EU outlandishly tried to make out as a “crime”. So this also, is Theresa May’s “crime”. Moses Herzog The EU’s concern with the Irish border doesn’t have anything to do with trade with the Republic. The EU’s concern is all about revisiting “the troubles” before the Mitchell settlement. The MPs representing Northern Ireland are particularly confused over this. On the one hand they do not want a hard border; but on the other hand they want a hard Brexit. The 31 Oct 2019 date was a compromise between the EU members. Some members wanted 12 months, others wanted 3 months. What Britain wanted was irrelevant, except that the EU wanted it longer than anything May really wanted. As it is, Britain will still have to take part in the EU elections in late May, and Britain will still have to pony up over 30B pounds to the EU without getting anything for their money. The hard Brexit folks were the ones voting for a no deal Brexit because they realized that an extension made it likely that there would be a second referendum. And that might be what Theresa May wanted all along…after all, initially May voted against Brexit and for Remain. As to my sources, I usually rely on Simon Wren-Lewis (economist at Oxford) and European news sources…especially Deutsche Welle. I’ve always had a fondness for these kind of “man on the street” type reports. Of course they choose affluent areas 9 times out of 10. Still it can be interesting. The only thing could have made it better is if he’d hit 4-5 pubs after the patrons had had a few beers. What’s the counterfactual over this time period? As the labor market tightens we should expect non-farm payroll growth to slow, right? There’s less people unemployed, moving into, or out of the labor force whose reservation wage falls below the market rate to pull from. conditional on Fed policy it’s pretty remarkable. this emp growth was in the face of massive monetary offset, enough that typically would have induced a recession. to be fair, we have to acknowledge that. ceteris ain’t paribus. also. emphasizing “Drumpf” when that’s not his name is as racist as always referring to Obama as “Barak Hussein.” Not recommended. formereconomist: Touchy, touchy. Well, if you want to transliterate my name as “Chen”, I won’t object. (And if one is delusional enough to *repeatedly* mis-identify one’s own *father’s*” birthplace as Germany, well, I’ll say all bets are off). I wouldn’t spell your name other than how you spelled it. I don’t engage in othering in order to draw lines and separate people. And I don’t find soft racism to be any more acceptable just because I don’t like the target or the target has said a lot of crazy things. But the larger point is that given Fed policy we SHOULD have had a recession, so the stable employment trend is actually pretty remarkable. Typically recessions come after 300 BP or so of tightening, and once you combine the effects of QT with the hikes in the funds rate, we are pretty much there. formereconomist: You’re taking Fed policy as exogenous (or at least orthogonal to fiscal policy). Is that correct? You are saying that Fed policy would have been as tight had there been no $1.5trn tax cut, etc.? Gee if Volcker had only ignored the 1981 tax cut – we could have hyperinflation during Reagan’s 1st term! Nope. Indeed I said “monetary offset,” and believe they need to be considered simultaneously. An independent central bank can easily nullify fiscal stimulus. That’s what happened here. It is de rigor for regressives like Menzie to spin the data. Context is vitally important. Yet Menzie all too often lifts out of context with impunity since many readers are not savvy enough to catch what he’s doing and call him on it. He isolates some sector of the economy and then uses statistical methods that laymen are not familiar with to claim that the soupcon you see through his microscope lens is the whole story. For starters, by Dec 2016 the economy was in late-stage expansion where payroll employment gains virtually always turn down. The straightening of the line on the graph is evidence enough that Trump’s policies nipped that in the bud. The very day after Trump’s victory, regressives like Menzie began ladling out blanket condemnation of what Trump policies would do to the economy and employment. Thus far real growth under Trump has exceeded that under Obama. And payroll employment has defied their forecasts. Quite an achievement when so much of the world is arrayed against you. Obama got an 8-year pass as the Fed held the funds rate to 16 basis points. Trump’s very first year saw the funds rate at 94bp. His second at 175bp. And here in the current year 240bp. Expansion killers for sure given the passage of time. Yet Trump policies defied this potent ongoing removal of liquidity from the system – multiplied even more by the full open spigot of quantitative tightening at the very time Trump took office. Yes there has been fiscal stimulus under Trump. But always monetary policy trumps fiscal policy. In any case, ignoring monetary policy as it affects the trend of an aggregate like employment is high court evidence that Menzie has an ax to grind. He rarely lets the chips fall where they may. Nor unless it serves his purpose does he report on all the pertinent chips as any true scientist would. He and his regressive acolytes attack this greatest president since Ronald Reagan with virtually every post. Name calling masked by the slender guise of economic analysis. He and they also attack honest contributors with whom they disagree with the logical errors of ad hominem, ridicule, and scorn. The very title of this post shouts sarcasm. You need not read past the headline to know what’s coming. James Hamilton and other honorable economists never do this. Sure. The guy who abhors name calling name calls freely when his baseless nonsense is revealed for what it is: reactionary chatter, I.e. ultra right wing boiler plate babble. What else would you call incessant spouting re: soon to be indicted traitors, international banker conspiracy, immigrants diluting the gene pool, glorification of a would-be dictator, et. al.? All delivered with an ego that would have difficulty fitting through any door at Trump Tower. And when I take my umbrella with me tonight – I will have caused the rain. Thanks for the most absurd comment ALL YEAR! Maybe those laypersons should take those analyses as a kind of learning opportunity. This is just meaningless mumbo-jumbo. Can you rigorously define “late-stage”? The economy has grown pretty much as predicted by CBO. Yes there has been fiscal stimulus under Trump. But always monetary policy trumps fiscal policy. This is just clueless beyond belief. Conventional monetary policy is very weak when the interest rate is at the ZLB. That’s when you should rely upon fiscal policy because only fiscal policy is effective. Do you believe the Fed should have a tight money policy during a recession, but a loose money policy during an expansion…even a “late-stage” expansion? Trump is a moron. He has no attention span. Never reads briefing papers. Watches Fox & Friends instead of doing his job. He’s so senile that he doesn’t know the difference between his father and his grandfather. He assaults women and then pays them off to keep their mouths shut. He cheats people out of their hard earned money. He’s a physical coward who equated the risk of going to Vietnam with his risk of getting STDs. He’s been caught lying about his supposed wealth. He lied about his academic record at Wharton. He lies about the most petty stuff, such as the size of his inauguration crowd and the size of his hands. But Trump was right about one thing. He could shoot someone on 5th Avenue and his gullible followers would still proudly wear their MAGA hats. I wonder how many of today’s Trump supporters also voted for Richard Nixon not once, but twice. That kind of personal voting history should disqualify anyone from ever exercising the franchise. Luckily for those of us who enjoy this blog, and have learned much from it over many years, Menzie is very tolerant of those who take cheap shots directly at him personally. James Kwak and Simon Johnson over at BaselineScenario blog had to also put up with tons of personal attacks and insults, after making a few sarcastic comments on their blog. James Kwak and Simon Johnson always took it for what it was, the same as Menzie does, and filtered very few comments. Many economists give opinions on things. It’s very natural in a subject that is very nearly intertwined with politics. I “may have” even seen some conservative/Republican economists make sarcastic comments, or even gone farther and made acidic comments. They have that right. I was under the impression that “conservatives” and Republicans claimed to be pro-freespeech. But you are making me wonder now based on your cry-baby whiny snowflake comment if you are against free speech just as many Republicans are “pro- free speech” in only word and not actions. JBH, do you have any idea when is the best time to use fiscal policy?? During an expansion or during economic stagnation?? And who on God’s green Earth told you that “monetary policy always trumps fiscal policy”!!?!?!?! Just on that alone you have revealed yourself, exposed yourself, as illiterate in the field of economics. Menzie observes you have exposed yourself as a babbling moron—so he treats you with the same treatment james Kwak and Simon Johnson gave those who cast aspersions and defamations on them. Letting your own comment roast you as the fool you are—and ignoring you. Stephen Moore goes on CNN to talk monetary policy with Erin Burnett. Watch and see how badly she burned this flip flopping nutcase! Those kind of charts make a great man like President Trump look impotent. The chart would have likely looked the same if Hillary Clinton had been president. Though, the trade deficit would not be so large and economic policy uncertainty would be much lower. Trump is impotent. Now our usual suspects would have Hillary have really strong but disasterous effects. Yea – putting an old lady in charge is always a bad thing in some circles! I suppose if those old ladies didn’t break email/government documents protocol related to national security, didn’t use the Secretary of State position to leverage money for a foundation and a future political campaign, didn’t lie about those activities multiple times, didn’t deny the media open question press conferences during a run for the U.S. Presidency, didn’t use a crony (Deborah Wasserman Schultz) to manipulate the DNC and the nomination convention, perhaps a majority of this country would be very happy to vote for that “old lady”. Unfortunately, there was no “old lady” nominated for President who didn’t do any of those things. Well, you know what the wise sages of old say……. She’s right!!!! Or is it HER is right?? It’s the female pronoun where whoever that pronoun is, is right, or the other person is horrid?? I get confused sometimes…… SHE put on some reading glasses and Hillary is having a rough day. How dare people want to know why U.S. diplomats were murdered?? Those are questions that the “little people” like Richard Holbrooke are supposed run around frantically answering, giving their blood, sweat, tears and literal lives for and that Hillary is there to take the bows for. Did you want to ask Hillary about rural female voters and how men forced them to vote for donald trump?? It wasn’t because Hillary worked at insulting rural voters during her campaign that women didn’t want to vote for Hillary—it was their bullying husbands. HER was right!!!! no…… SHE was right!!!! You pigs!!!! Erik Poole: Every single comment I make on this site about the economy has been tested in the fire of my own empirical analysis. As my graduate fields were Math Econ and Econometrics, I certainly have the book-learning and additionally-developed competence to do this. Over the years I built up a considerable toolkit of proprietary indicators and models that have stood the test of time, giving reasonable (if not often exceptional) out of sample forecasts. As my gift to you, I will explain one of these. In all my comments here over the past decade-and-a-half I’ve never once mentioned this index. Part of the Art is in keeping things simple. This is so with theory and empirical analysis. Complicated consumes far too much precious time given how many bases there are to be touched in this most challenging field. Forwarding to the present, I scored the March beige book -4. Score it yourself in the manner I describe here and see what you come up with. The beige books are archived under the Monetary Policy tab on the Board of Governors website. Currently the 12-mo average is 1.8 and the 6-mo -0.3. The index itself is just a running string of integers ranging between plus and minus 12. Per this index there is no recession in sight. How does one come up with original indices like this? First of all by having a true top down view of the economic sphere and the larger sphere around it that influences the economy. It is one of the great failings of modern economics that few macro practitioners have this broad comprehensive view. Secondly and equally important, one must also descent from the celestial dome to the fruitful plains beneath glimpsed from that perspective, and then dig deeper than anyone else in the potentially rich places you spot. In this I am expressing a lesson that reading the works of the greats teaches: especially the greats in the physical sciences. The original works of the greats have stunning clarity. No secondary author can ever match it. I believe this is so because when these giants surface from the depths they’ve plumbed, they came up with so much more than others that they simply had to boil it down to basic essentials. Keynes’s General Theory is a standout exception. Compare his muddledness, genius though he was, with the crystal clarity of Carl Menger’s Principles of Economics, free pdf off Mises.org. Now to my point. I’ve looked empirically with great care at the Bloom et al Uncertainty Index. I’ve reached the conclusion that it has very little (useful) correlation with anything in economics. (In this I am looking for a contribution not already made by more standard variables.) I have read every paper out there. Most of which are by the authors. Nada. This is not a comment on how things would have turned out under Hillary. Nor a comment one way or the other on the trade deficit. It is, though, to say this about what you said about economic policy uncertainty being much lower — Big Deal. The statement about policy uncertainty you made was probably off the top of your head, perhaps instilled in your mind by what you’ve read on this site. But I’d encourage you to always do at least some empirical work yourself on this and any (every) other topic, because if you do not you have then bought into the textbook version hook line and sinker. Or in the case of things not yet in the texts, you have bought into the hype around it. A simple OLS regression, in either level or first differences as appropriate, with the dependent variable being AnyAggregate and policy uncertainty being the independent variable, will do wonders to clearing up in your mind about how efficacious the Uncertainty Index is or is not. Wow, you are serioously off the wall. You claimed tha US growth rate under Trump has far exceeded that under Obama. BS squared. Here are the annumal growth rates of their administrations annually. So, yes, Trump’s rates beat that in 2016, although going from 1.9% to 2.2% is not some massive zoom. But Obama had three years with higher rates than Trump’s in 2017, with another tying it. Trump got it higher in 2018, but Obama als had a year with the sam rate, 2015. And now the rate has slod back somewhat. If one looks at quaters, Obama has three of them with higher rates than Trump’s highest. So, JBH, sorry you lied, and all your supposed math and econometrics cannot undo that. Barkley Rosser: In virtually all papers in the economic literature, the conventional way of comparing growth rates across different time periods is by computing the compound rates of change. From 2008Q4 to 2016Q4, the growth rate of real GDP under Obama was 1.88%. For the data thus far, 2016Q4 to 2018Q4 growth under Trump has been 2.72%. Leaving some room, I would say you have utterly no comprehension of how significant this difference is. You then ascribe to me having said that growth under Trump has far exceeded that under Obama. I said no such thing. And to top it all you have the unmitigated gall to call me a liar. Two years? Two years? C’mon – this is stupid even for you. BTW – Obama inherited an economy in a deep dive recession. Of course his 1st years were not great. Obama left Trump with a rising economy. CoRev’s latest global warming denying has a new twist. He wants to take the reported temperatures over time and divide that series by the consumer price index! Our Usual Suspects are incredibly funny!!! Looking at the correlogram of dlog(payems) from 2010m1 to 2019m3, the residuals do not appear to be correlated, This is why I assume that you regressed dlog(payems) on c. Why do you think the monthly changes seem to be a random walk with drift as opposed to a deterministic trend or some form of AR or MA structure? Just a hobbyist looking for enlightenment. AS: I know from previous experience that log PAYEMS fails to reject unit root null using ADF, DF-GLS of ERS, while rejecting KPSS null of trend stationarity. AS A lot has to do with the sample range you use. If you use Menzie’s 2010:01 thru 2016:12, then one order of differencing is all you need to remove autocorrelation. But if you chose a sample range such as 2008:01 thru 2016:12, as suggested by CoRev, then the correlogram shows an AR(2) signature, but the sum of the phi coefficients exceeds 0.90, suggesting unit root concerns. At this point you’d probably want to use an ARIMA(1 1 0) against dlog(payems) rather than the ARIMA(2 0 0) suggested by the correlogram. A somewhat more straightforward approach would be to just work with the log(payems) rather than dlog(payems) and then run an ARIMA(1 2 0) model…you get the same result but you save yourself the trouble of having to transform the forecast back to log levels. The problem with using 2008:01 as the starting point rather than 2010:01 is that you’ve introduced this structural break or turning point with the recession. Thanks for the comments. I understand the starting point comment. I have worked with one Log(Payems) model starting with 2003m8 through 2019m3. EViews has a breakpoint unit root test that seems to show that an intercept break occurred at 2008m7 for Log(Payems) and appears to go through 2009m6. I included log(Payems (-1)), log(icsa) a trend and trend^2 . The diagnostics seem indicate that the model is ok, Interestingly the model seems to show better diagnostics starting the break at 2008m3. I understand that if the trend breaks, this model breaks, just having some fun trying to forecast Payems. I also ran the model from 2003m8 to 2016m12. The dynamic forecast from 2017m1 to 2019m3 seems to work well. The Theil U2 coefficient is 0.42. Since a U2 coefficient less than 1 is desired and the smaller the better, I was encouraged. Often my dynamic forecasts seem to show a U2 greater than 1. All of this is at the edge of my paygrade, so you may find problems. My analysis comes out the same as Menzie’s. There is no break in trend based on the period 1/1/10 to 12/31/15. It’s obviously hard to argue the counter-factual. 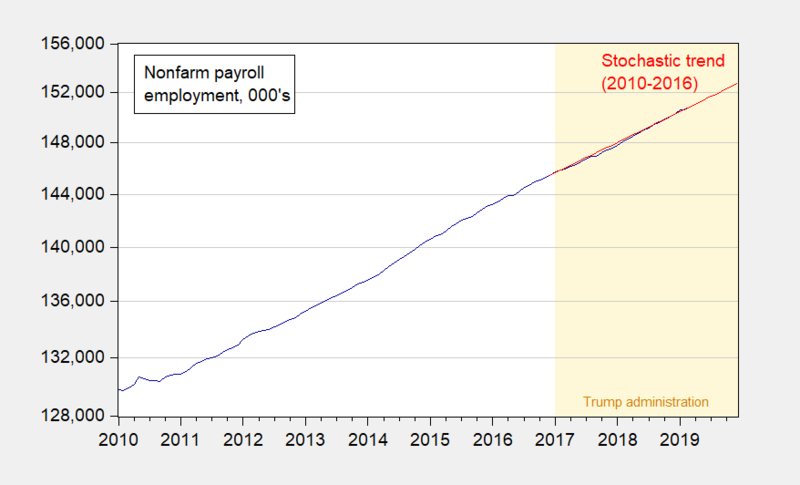 Perhaps employment would have grown less without the stimulus package, but it’s hard to make that point without a pretty detailed analysis of expected employment growth at this point in the business cycle. I think, instead, the JOLTS data gives us better insight into what happened. If you look at the JOLTS data, you can see a huge increase in job openings following the tax cut. The pace of hiring, however, was essentially unchanged. This leads us to believe that employers, although they would have liked to hire more employees, were unable to do so. This may have to do with a lack of surplus labor this late in the cycle, or perhaps related to the logistics of hiring, which involves protracted effort: recruiting, screening, making a decision (months! ), agreeing terms and bringing an employee on line. This can easily take six months, or more — particularly when the labor market is already tight. In any event, the JOLTS data suggests that the tax cut did indeed stimulate increased job openings, but for whatever reason, the labor market was unable to increase the pace of hiring. The implication is, I think, that the unfulfilled jobs turn into imports. That is, the primary effect of the tax cuts appears to be a notable increase in the trade deficit, rather than a surge in employment. The lesson, as has been stated before, is that stimulating an economy at the top of the business cycle is likely to prove a mis-allocation of funds. Steven Kopits: Good comment. Here’s a finishing touch. Take the JOLTS data. Define Excess openings as the Job openings rate minus the Hires rate. From the latest NFIB monthly survey get NFIB Job Openings (% of businesses with positions not able to fill right now). The y-variable is Excess openings. The NFIB % of positions not able to fill right now is the x variable. Regressing y on x gives a 71% adj R-squared. In laymen’s terms, this means that roughly 71% of the jobs that are open are so because there are not enough qualified candidates to fill them. The next variable I would put on the rhs of the equation is qualified workers who are working in zombie corporations kept alive by maldistribution . Here we run into the problem of not having a good metric for maldistribution. Perhaps some Japanese economist who’s dealt with this problem during Japan’s lost decades has devised a metric for maldistribution. In any case, the big component here is lack of qualified workers for jobs that do exist. This is the keylog in the logjam. Dislodge this log and the flow will surge. Here’s a simple way to resolve this core educational problem policy-wise. Nationally rank all superintendents, high school, middle school, and grade school principals according to student test scores per international standards, taking into account community and family background of the schools. Then by executive order of the president, cut the salaries of the worst performing 20% at all four levels in half . Those affected can resign or not. Rinse and repeat the following year after reranking according to the international standards. At most I’d say it would take three years and NFIB businesses would no longer (according to their survey) have this number one problem of labor quality. This applies to the public-school system only. The presidential committee tasked with this should also in their final report recommend that schools go back to teaching the three Rs the way they used to be taught, and emphasize the building of independent thinking skills, with deemphasis on rote memorization except in subjects like chemistry. This would affect a trivial number of around 20,000 individuals who earn a lot of money but do a poor job in nationally vital positions. If you want to fix public schools, you have to change the way Senators, Congressmen and the White House is paid. It is the objective function of the owners of SOEs — and public schools are SOEs — which determines performance. That’s fine. I stand by my comment. The notion of public schools is that parents and children should have no choice. For an economist to argue against choice, against letting markets work, seems strange to me, Menzie. Steven Kopits: You’re free to choose. I’m not stopping anybody from paying for their kids to go to Andover. Just like I’m not stopping you from sending your kids to Harvard. I don’t think the average person is free to choose. Yes, the elites are, and that’s my point. But people on tight budgets? Not so much. Why shouldn’t inner city black families have choice? Put another way, what is the government’s comparative advantage at education? I don’t see that they have any. Just like the don’t in automobile manufacture or newspaper publishing or healthcare provision. The implication, however, is that these institutions are run principally for their staffs, not for the students. When the government is both the seller and buyer of services, then the actual end users are not going to be optimally served. And the public ends up with the risk of incredibly distorted public finances, to wit, Illinois, Jersey, NY, CT, US Federal government. Steven Kopits what is the government’s comparative advantage at education? I don’t see that they have any. Just like the don’t in automobile manufacture or newspaper publishing or healthcare provision. You used the term “comparative advantage.” This is an econ blog, so the term has a very specific meaning. Are you sure that’s what you really meant? BTW, I went to a public high school in the Chicago suburbs. At the time it was the highest North Central rated school in the state. My economics teacher got his PhD from the Univ of Chicago. Then again, econ was kind of important in my small village; e.g.., at various times George Stigler, George Schultz, and Beryl Sprinkel all lived in my village, as did other well known folks (including John Dean). Michael Beschloss was in my sister’s class. We had five foreign languages in high school: Latin, German, Russian, French and Spanish. My high school had a college graduation rate of over 80 percent…and that was back when most people didn’t even go to college. The point is that public schools can do just fine. It just costs a lot of money, and that means people have to be willing to pay high taxes. The crime is that not everyone can be privileged. The bigger crime is that the privileged only want their own children to enjoy privileges, so they’re happy to pay for expensive private educations as long as they don’t have to pay for other people’s public education. Oh boy! By executive order of the President order cuts to salaries of selected school administrators in all 50 states. Your knowledge of the Constitution is breath taking. But it just might be that some of those affected by this presidential decree would also be among the traitorous miscreants named in those 297, 011 indictments you’ve guaranteed–sort of–that are on their way. Maybe an executive order can free them or maybe the President can cut the salaries of judges he doesn’t like until they’re produced. JBH and Princeton Stevie boy as manipulating JOLTS data again? Do these two clowns even know it is provided by the dreaded BLS? BTW NewDealDemocrat has a great post using JOLTS data over at Angrybear. Check it out. BTW Princeton Stevie boy will attack it as NDD dared to used FRED (FRED I tell you) to draw his graphs! The issue is not whether he cuts or not, but that he is involved in the decision at all. Your analysis???? LOL! Your sources of data? Oh yea JOLTS. Link please. Oh wait – JOLTS is provided by http://www.bls.gov And the idiot known as Princeton Stevie boy thought it was superior to BLS data. Still refusing to read your worthless blog! Wait – your graph uses JOLTS data but you did not source it from BLS? You reproduced a graph on another blog. Lord – you are a true hypocrite. Of course I trust Bill McBride. No one trusts you. What’s the matter Stevie boy – was getting JOLTS data into an Excel file too hard for you? You got all of this gibberish from Bill McBride’s graph? Lord – you just make it up as you go. I doubt you even understand what “misapplication of funds” even means! You certainly have no clue what you meant with that first stupid sentence.